I'm participating in my friend, Melanie Testa's "Inspired to Quilt, video prompt challenges." These journal pages are the first step in creating some stamps. Husb and I and a group of good friends traveled to Oaxaca, Mexico in 2004. It was a fabulous, fascinating trip! One of our best. I kept a journal with writings, sketches and photos, and for this assignment, I went back through the journal and selected patterns that intriqued me. This looks like great fun and a wonderful way to get ready for my retirement on June 30th! Thanks for sharing the link - I can't wait to return to my dyes, resists, silks. 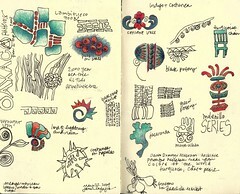 It's fun to see your journal pages! I need to get back into the habit of keeping mine. Just looked at some old ones yesterday and realized it's been a month!